From your perspective as a humanitarian organisation or learning service provider. A digital badge is a digital credential that can be shared and verified online. A digital badge contains similar information to a traditional paper certificate, but provides more detail, is more secure, more useful and much more easy to share over networks, through social media and other methods. Technically speaking, it is an image file (typically PNG) that contains credentialing information that is “baked into” it. The credentialing information is formatted according to the Open Badge standard. Other types of digital badges exist. They may be simple images or shareable only on the platforms they were created on, for purposes such as gamification. But digital badges that are Open Badges can be displayed on any system that supports the Open Badge standard. This makes them portable and fit for professional recognition. This means that humanitarians can carry forward the badges they earn into new organisations and careers. What information can be found inside a digital badge? Recipient (or Earner) The identity of the badge earner, encrypted to protect personal privacy, but authentically verifiable. Who is behind the Open Badge standard for digital badges? The Open Badges Specification was developed by Mozilla Foundation in 2011. On January 1, 2017, IMS Global became the organization responsible for the advancement of the Open Badges specification and community. Detailed technical information about the standard can be found at Open Badges 2.0. Why does HPass use digital badges? Who can earn digital badges? Digital badges are most often awarded to individual badge earners. However, organisations may also be awarded badges for achievements or attainment of standards. How are digital badges earned? Many badge issuers award digital badges based on successful completion of courses and workshops. These can be face to face or online learning opportunities. However, there are many other useful contexts for awarding badges, such as through assessment that is unrelated to a course. How can you evaluate the quality or value of a digital badge? Do you know the issuer organisation? Does the issuer organisation meet sector-recognised standards such as Learning Provider Standards and/or Assessment Provider Standards? What was required to earn the badge? Was there some kind of assessment involved? Is there evidence provided about how this earner earned this badge? Is the badge aligned to a competency framework that you value? This can be a horizontal or transversal framework, such as the Core Humanitarian Competency Framework. Or it can be a vertical or specialty framework that describes competencies in a technical domain. How can digital badges benefit me as a Learning or Assessment Provider? You may wish to issue badges to recognise successful completion of your learning programs or competency assessments. When earners display your badges they are not only displaying what they know and can do, they are also displaying where and how they acquired the badges, increasing the digital profile of your offerings in the humanitarian community. You may also wish to earn endorsements for your organisation from HPass or other badge issuers who can validate your expertise, service quality or other differentiating attributes. This will help promote your organisation in an authentic way. Can digital badges be added to online courses? Using a plugin, e-learning outcomes such as course completion inside the LMS can trigger badges in Open Badge Factory. Currently there is no integrated plugin for the CornerstoneOnDemand platform which serves systems such as DisasterReady.org and IFRC/ICRC’s Learning Platform. However, DisasterReady is using an alternative method to produce digital badges that can be shared in HPass. New plugins can be developed for other platforms in small projects if funding is available. Contact us to learn more. 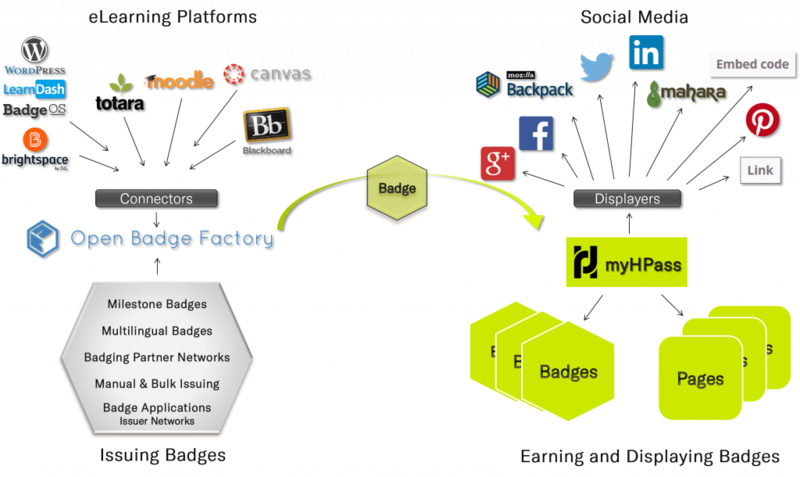 Digital badges can be issued in many ways, not just through learning management systems. Organisations can develop multi-channel badge issuing strategies that could include e-learning courses, self-regulated learning programs, face-to-face workshops and even workplace assessment and development. How can my organisation become a digital badge issuer? The public service will be launched on a paid subscription basis in 2019 for humanitarian organisations eligible for HPass. How can my organisation become “eligible for HPass”? How can my organisation become “HPass Approved”? Issuers of digital badges on HPass can ask other organisations to endorse their organisations or their badges. This increases the value of their badges, depending on the identity and credibility of the endorser and the details of the endorsement. As a special case of endorsement, HPass will accredit organisations as “HPass Approved” if they can demonstrate audited compliance with the HPass Standards, as described in the quality assurance mechanism (QAM). Do I need special skills to become an digital badges issuer? We recommend that organisations who want to issue badges seriously use professional designers to develop their badge graphics. There is an online badge design tool, but it is recommended only for experiments, “mockups” and placeholder use. Webmaster skills are needed to integrate the HPass service to a learning management system using existing plugins. If you already have a learning management system, you likely have access to those skills. Programming skills are needed to develop new plugins. Plugin programming can be outsourced. 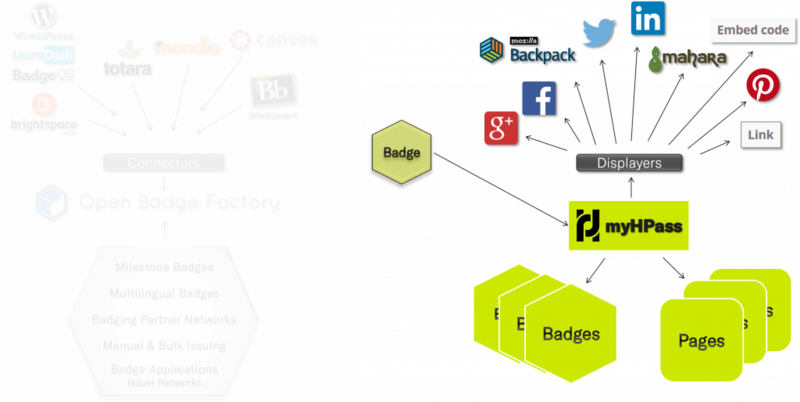 How should my organisation start exploring digital badges as a badge issuer? We recommend that organisations start off simply, through hands-on exploration with small experiments, building richness and sophistication over time. Hands-on exploration will help dispel mistaken assumptions and familiarise you with the system's capabilities. This will help your planning. Issue badges by other methods: badge application forms, integration with learning management systems such as Kaya, etc. Explore other features of the system: badge issuer networks, seeking and awarding endorsements, etc. HPass has developed a Badging Fundamentals workbook for early adopter organisations in the pilot that follows a similar sequence. Contact us for details. How can I use digital badges as an employer or volunteer organisation? You may want to use badges to evaluate the skills of candidates. You may also choose to endorse certain badges, encouraging candidates to earn these badges to increase their chances of being engaged by you. In this way, you can improve your quality of hire. You may also use digital badges for your incumbent workforce, encouraging employees and volunteers to earn badges for their professional development or by recognising their achievements. You can flag certain badges to signal desired skills and track their acquisition. You may also wish to become a badge issuer yourself in order to recognise your internal training and assessment programs or for public talent pipeline engagement programs that you may be running. HPass is working to improve the system so that you will be able to search for skilled workers through a badge-enabled “skills registry”. How does the HPass platform work? myHPass, a storage and display platform offered by HPass, configured as a central skills hub for the humanitarian sector. This service is free for individual badge earners. How are badges issued and earned? By integration with learning management systems s such as Moodle or Totara or online community platforms, such as Wordpress. For example, certain courses on Kaya issue Open Badges. How are badges accepted and shared? Badge earners receive links to their badges by email and are guided to create free accounts to accept and store their badges on myHPass. Once accepted, badges can be made public and shared individually or on Pages with other badges and additional evidence of skills such as CVs. Individual badges and Pages can both be shared on social media. Does HPass accept badges earned in other systems? Yes, as long as they comply with the Open Badge standard. Open Badges issued from other systems outside HPass such as Moodle, Credly and Badgr, can be uploaded to myHPass by badge earners. What will HPass cost for an organisation? 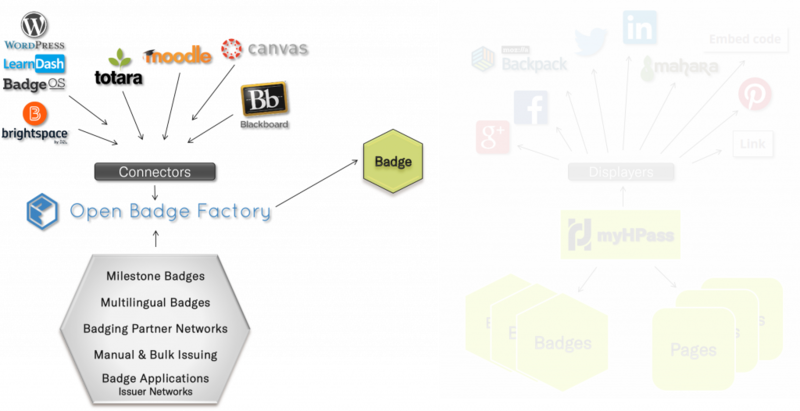 Organisations can already subscribe to Open Badge Factory at different levels. HPass is working to develop a cost structure for participating humanitarian organisations, using the cost structure of Open Badge Factory as a starting point. For more information, go to openbadgefactory.com. Are there other requirements for organisations? Organisational users may also be optionally further recognised as “HPass Approved” if they can demonstrate audited compliance with the HPass standards using the Quality Assurance Mechanism. This will make their badges more visible and accessible to badge earners and badge consumers who seek HPass quality-marked learning or assessment providers.